Nov. 16, 2011, 11 a.m. It might be a perfect match for the Internet-connected car — and evidence the network is thinking more like a digital start-up. By Andrew Phelps Nov. 16, 2011, 11 a.m. In a way, radio is the perfect user interface. Turn it on, and It Just Works. This week, NPR unveiled Infinite Player, a web app that mimics the simplicity of radio, but with a personalized twist. Press play to hear the latest NPR newscast, followed by a never-ending playlist of random feature stories. It doesn’t stop till you turn it off, just like the radio. Yep, it’s like Pandora for public radio, something I wished for aloud just a few hours ago. You can try it out now in recent versions of Chrome and Safari. If finding and listening to audio is first and foremost in your mind, we offer tons of podcasts and program audio clips. You can queue these stories up on a playlist to run consecutively, or just hunt around individually to find the ones you want. You can even sync your playlist across browsers. All this requires a lot of the user’s attention. That model works very well for some people in some cases; but it’s a far cry from the roots of radio in which the listener simply hits a button and listens. Yoch writes about the difference between engaged and distracted listening. You can guess which of those two is a bigger challenge for public radio these days. He said he took a cue from personalization products like Zite, Flipboard, and YouTube’s LeanBack, all of which helps users wade through an ocean of content to find just what they like. “Last winter we spent a chunk of time thinking about how to make NPR available more ‘ubiquitously’, the real focus of which was determining the critical components of a successful NPR experience and ways we might deliver them more uniformly across platforms,” Yoch said in an email. The player is also able to pull in stories from local stations who expose their data to NPR’s API, heading off concerns about so-called digital bypass (a topic I have written about before). The current version of the player can’t mix and match national-local content, but Yoch released customized players for KQED, Michigan Radio, and KPLU. Infinite Player is a product of NPR’s culture of rapid iteration and a peek into the future of radio. The project came together in one-and-a-half development cycles — that is, about two weeks plus a few extra days to squash bugs. And it’s not a product release in the traditional sense, said Kinsey Wilson, NPR’s general manager of digital media. “It’s not nearly as baked as something we would launch even as a beta project. But it’s a way to do some rapid innovation and see if we’re even close to the mark and how people react to it,” he told me, echoing some of the language web developers use to describe the lean startup model or the Minimum Viable Product. It could be released as an official product eventually, he said, once NPR figures out how and where consumers would use it. Terrestrial radio perseveres because people still drive — NPR’s largest (and most captive) audience on any given day is commuting to from work. But Internet radio poses a serious threat. That may well be the way NPR — and any big news organization disrupted by technology — will remain relevant: by acting a lot more like a digital start-up. POSTED Nov. 16, 2011, 11 a.m.
Phelps, Andrew. "NPR’s Infinite Player: It’s like a public radio station that only plays the kinds of pieces you like, forever." Nieman Journalism Lab. Nieman Foundation for Journalism at Harvard, 16 Nov. 2011. Web. 23 Apr. 2019. Phelps, Andrew. "NPR’s Infinite Player: It’s like a public radio station that only plays the kinds of pieces you like, forever." Nieman Journalism Lab. Last modified November 16, 2011. 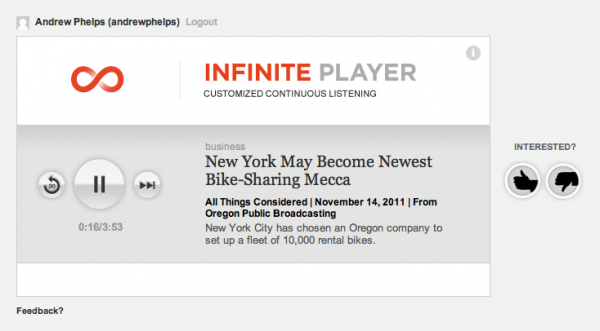 Accessed April 23, 2019. https://www.niemanlab.org/2011/11/nprs-infinite-player-its-like-a-public-radio-station-that-only-plays-the-kinds-of-pieces-you-like-forever/.